This document is being deprecated and replaced by individual articles about the topics it covers. FireCloud runs on the Google Cloud Platform. All FireCloud costs, including storage, compute, and data egress, are ultimately billed via Google Billing Accounts. In order to be compatible with multiple cloud environments, institutional payment systems, and security requirements, the FireCloud interface does not directly display the Google Developers Console Billing interface. Instead, FireCloud will connect a Google Billing Account to an associated FireCloud Billing Project. When using FireCloud, it is these FireCloud Billing Projects that you will see in the interface, and to which FireCloud will charge your usage costs. In order to create or clone a new workspace in FireCloud, you must have access to at least one FireCloud Billing Project. Google Projects created outside of FireCloud by users are not permitted on FireCloud. There are two ways you can gain access to a FireCloud Billing Project. The Owner of an existing FireCloud Billing Project can authorize you to use his or her FireCloud Billing Project. Billing Project Owners should refer to Adding Users to a FireCloud Billing Project for instructions. First you must set up a Google Billing Account following the steps for Broad Internal Users or General Public. 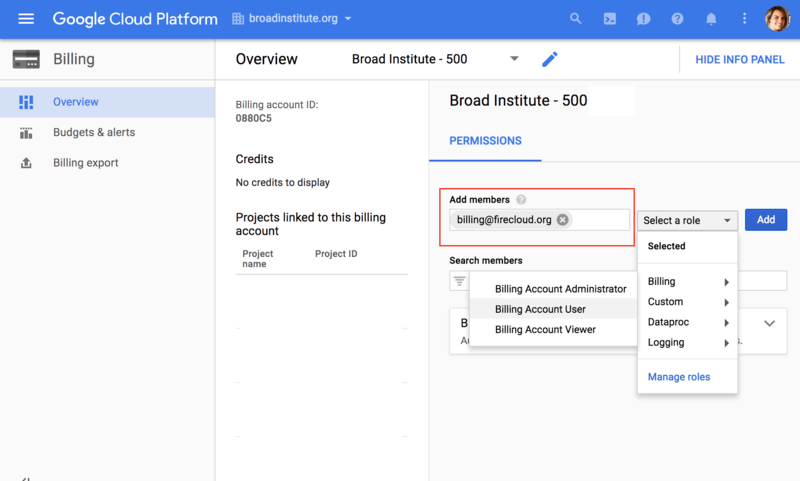 Broad internal users can request a Google Billing Sub-Account to bill FireCloud usage costs to a Broad Managed Cost Object. A Google Billing Sub-Account will allow you to create FireCloud Billing Projects. Any charges incurred within these FireCloud Billing Projects will ultimately be billed to the Broad Managed Cost Object. Before you request a Google Billing Sub-Account, please speak to your Grant Admin and Primary Investigator (PI) to determine the availability of funding, and to discuss a monthly and total budget for FireCloud. We will use the budget information to set up email alerts to notify you when spending exceeds a percentage of your budget. By default, alerts are sent at 50%, 90% and 100% of your budget. After we set up your Google Billing Sub-Account, you can modify your budgets and alerts through the Cloud Platform Console. Refer to this Google Help Topic for more information. Please note that it may take up to several business days to process your request. We will verify information with the Grant Admin and PI as needed, and may request additional information. Once we process your request, we will send you an email including the Google Billing Sub-Account ID, which you can then use to Create a New FireCloud Billing Project. Create your own Google Billing Account using a credit card or bank account. Talk to your institutional procurement office and see if they have a preferred account set-up method with Google (such as a third party reseller or an existing account). Set up a Google Billing Account through a third party reseller. There are many options and two examples are: Onix Networking or Sada Systems. Third party resellers provide additional billing options at no extra cost. 2. Add [email protected] as a Billing Account User to your Google Billing Account. After this, you should be able to create a new FireCloud Billing Project. See below for more detailed instructions. Go to the Google Developers Console Billing page and click on Add billing account. You will need to provide billing information but can start with Google's free trial that includes $300 in compute and storage credits. Please follow these steps to add [email protected] as a Billing Account User to your Google Billing Account. Go to the Google Cloud Console page. Navigate to the Google project aligned to the Google Billing Account you will use for FireCloud. You can do this at the top of the page next to the Google Cloud Platform logo. Click Billing from the hamburger menu. A new window will open. On the right panel, below "Permissions" and will see "Add Members." Add [email protected] and select the role Billing Account User. Click Add. Please do not remove the Billing Account User until after you create a FireCloud Billing Project. To remove the FireCloud Billing Account User from your account, click on the trash can icon next to [email protected] on your billing account page. To find Google Billing Account information, navigate to the Google Developers Console Billing page and click on Billing. Look for the number below Billing Account ID. After you set up a Google Billing Account, you can create a new FireCloud Billing Project through the Billing Management Screen in the FireCloud UI. 1. In the FireCloud UI, click on the User Profile drop-down menu and select Billing. 2. Click on Create New Billing Project. If prompted, Click Here to Enable Billing Permissions, select a Google identity under which you created a Google Billing Account, and click Allow. This enables FireCloud to access Google Billing Accounts associated with your FireCloud account. 3. Enter a unique name for your FireCloud Billing Project. Then, select the Google Billing Account that you want to tie to your FireCloud Billing Project, and click OK.
be unique across all Google Billing Projects. Note: You may see multiple Google Billing Accounts that you can select for this FireCloud Billing Project. If you need to locate a Google Billing Account ID, navigate to the Google Developers Console and click on Billing. Look for the number below Billing Account ID. You do not need access to a FireCloud Billing Project to use FireCloud. Tutorial workspaces with open access data will be available to view after your register. In addition, if a FireCloud user, such as a collaborator or PI, shares a workspace with you and grants you WRITER access, you can compute within that workspace. All charges incurred for that workspace will be tracked through the workspace owner’s FireCloud Billing Project. When you create a new FireCloud Billing Project, you are automatically designated as the Owner. If lab or team members want to create or clone new workspaces, you can grant them access to any FireCloud Billing Project of which you are the Owner. First, your lab and team members must independently register as FireCloud users. 2. Click on the FireCloud Billing Project to which you want to add users. You must be an Owner of that Billing Project to add users. 3. To add a new user, click on Add User… Note that the user must first be registered for FireCloud. 4. In the pop-up window, enter the user’s FireCloud email address and select a role: User or Owner. Then click OK.
Owners can add additional users on this FireCloud Billing Project. Users can also create workspaces charged to this Billing Project, but can not add other users. In order to create a FireCloud Billing Project, you must first set up a Google Billing Account. You can follow instructions above for Broad Internal Users or the General Public. If lab or team members want to create or clone new workspaces, you can grant them access to any FireCloud Billing Project of which you are the Owner. First, they must independently register as FireCloud users. Alternatively, you can create and share workspaces with other users in your lab. If you grant users WRITER access to a workspace, they can run analyses and compute on data. Any compute and storage costs incurred within a workspace will be charged to your FireCloud Billing Project and its associated Google Billing Account. You can leave us a comment on our Forum for any project or billing-related inquiries. A Support Specialist will reach out to you privately via the Forum's inbox system for private communication. In addition, please try the solutions below for the following issues. Please verify that [email protected] appears as a Billing Account User on your Google Billing Account. Refer to instructions to Add the FireCloud Billing Account User to your Google Billing Account. After you add the Billing Account User, you should be able to create a FireCloud Billing Project. Another reason you may not see your Google Billing Account is that you enabled FireCloud Billing permissions for the incorrect Google ID (Gmail address). Please be sure to enable FireCloud Billing permissions for the Google ID under which you created your Google Billing Account. You may need to close your FireCloud session and/or log out of the incorrect Google account before re-enabling FireCloud Billing permissions. This happens when you try to create a project but reached your Google quota. You may need to request additional projects from the Google Console as described in this help topic.